What’s your favorite holiday? Christmas? Halloween? Maybe, Fourth of July? I couldn’t tell you every single person in the world’s favorite holiday, but what I could tell you is all moms around the world have one favorite holiday in common. Mother’s Day. In case you’re behind on filling in your planner this year, or maybe just haven’t checked the calendar lately, Mother’s Day 2018 is coming up in just a few short weeks on May 13th. Whether you’re a planner, or more of a last-minute kind of person, Fresh Beginnings has you covered on all your favorite holidays, and Mother’s Day is no exception. This year, the variety of YUM over at Fresh Beginnings is never running low. The Mother’s Day collection is cuter, and better than ever before – a sure way to make Mom feel special this Mother’s Day. Your mom makes you feel special on every holiday, or if you’re anything like me, every.single.day of your life. My mom never fails to make me the happiest girl, and she did give me life… so let’s just say I owe her one. 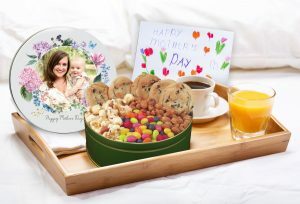 Some of my favorites include the adorable the Mother’s Day Gourmet Cookie Bucket in gold with the fun “I love you so much” graphic tin lid design. There are so many fun choices up on the site under the “Mother’s Day” collection tab, from pinks and springtime colors to yummy treats in super fun packaging. Maybe your mom isn’t such a cookie person but enjoys a nice assortment of perfectly roasted and seasoned nuts. Grab the Nut Trio Tin or Trail Mix Trio Tin off of the website for a sweet and salty changeup. Want to really spoil your mom this year, and make her feel like the BEST mom in the world? Spring for one of the beautiful Mother’s Day Tower Collections to incorporate multiple sides of Fresh Beginnings cookies in one largely awesome gift! Get the “Best Kid” award this year and surprise your mom with an assortment of Fresh Beginnings goodies for a super unique and memorable gift. Don’t forget the awesome customization feature on Fresh Beginning’s website where you can customize almost every single Mother’s Day product featured by simply uploading a picture of you and mom, or adding some personal text to the tin lid. Pick your favorite picture of you and your mom and add a sweet message to make your tin lid truly something special. Who wouldn’t want to open a custom tin with their face on it AND get to enjoy some yummy cookies and goodies from Fresh Beginnings. Want to get in good with your mother-in-law? Send her a tin of cookies with a sweet Mother’s Day message on it. Want to include your amazing grandmother in the Mother’s Day festivities? Send her an assortment of goodies with a sweet, personal message. Just want to send some special lovin’ to your mama this Mother’s Day? Don’t wait! Order the best cookies ever for a for-sure smile on her face and perfect Mother’s Day treat. Go on a picnic – pack her favorite food, wine & a gourmet tray of Fresh Beginnings cookies for the perfect picnic dessert! Make her a homemade card – or a “homemade’ goodie tin? Not exactly homemade but just as personal and even more yum! Take her out for a nice dinner – all moms love to be spoiled, just like we do, so take your mom out for some yummy food and finish the night with Fresh Beginnings for dessert. 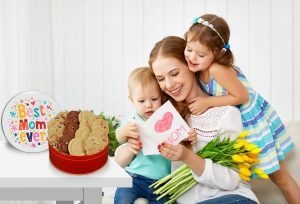 Surprise her at work – instead of the basic sending flowers or a Hallmark kind of card, send your mom a tin of delicious cookies as a surprise at work. She’ll absolutely love it and all of her co-workers will be jealous. Make her a basket of her favorite things – Throw together a cute basket filled with your moms top favorites when it comes to candy, snacks, wine, magazines, and more. Top if off with a cute gourmet cookie bag with a picture of the two of you on it. Still not sure what to do to make mom feel special this Mother’s Day? Check out the Fresh Beginnings website for some inspiration on all things YUM and surprise mom with a present she’ll never forget and is sure to enjoy.